Here are some more pictures of our favorite celebrity family. What a cutie!! He looks just like Clay! Thank you for sharing pics!! Adorable baby! Thank you for the Clay Aiken family pictures! I see the lipbite just like his father. So cute. Thanks for sharing the pictures here. Nice to see them all together like this. I love to see Clay out with Jaymes, just doing regular grocery shopping….Just like everyone else… That pretty well says it all for me about Clay… For a Superstar..he’s pretty well “down home”… For some reason, this pic just touches me…..
A D O R A B L E !!!!!!! What GREAT pictures! Parker is adorable and James looks great. 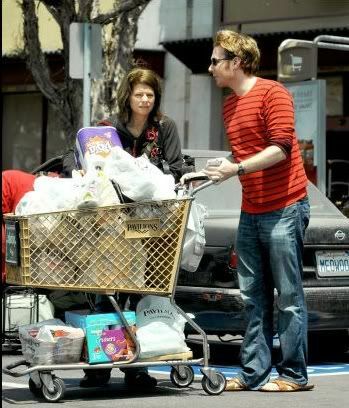 I like the picture of Clay Aiken and Jaymes coming from the grocery store too. What a cutie baby he is..so adorable! I’m so happy that we have these pictures of Parker to know how happy and cute he looks! Clay and Jaymes must be so proud of him. Adorable is the word of the day! Wow! I’m happy to see Clay, Jaymes and Parker so happy and what a beautiful scene. Wonderful to see Clay and Jaymes out shopping..just like us regular folks. Boy, they sure had that grocery cart filled up, Pampers, Viva Towels, almost looks like my cart(minus the Pampers, of course) Today was one of the best days in a while..after all, we finally got to see the little sweetiepie..and what a cutie he is. How adorable! The Aiken/Foster family out and about. Loving the pix much. Parker is adorable! That seems to be the word of the day! He looks like his Daddy…who is adorable too! I love every single pic of Clay, Jaymes and Parker. I am so happy for all of them. Oh my goodness…………that child is ADORABLE!!! I am sure that momma Jaymes and daddy Clay are enjoying every minute with that sweet child. Thanks for sharing CANN. Love the father..love the son…thanks! What a beautiful baby Clay Aiken and Jaymes Foster have and he looks healthy and happy. God bless this beautiful family. Couldn’t ask for a better life for Clay. I am so proud of him and his beautiful, loving Jaymes and Parker. I feel sorry for those that walked away from Clay when he came out. This is proof of the wonderful life that God has given Clay and that Clay so appreciates. Love to all three of them. Parker is such a little angel. He is the spitting image of his gorgeous daddy, right down to that lipbite. What a beautiful family they make. Jaymes looks great. These pictures of Parker just make me smile! It is so touching to see how happy and relaxed Clay looks with his unconventional family. He truly has a beautiful family and it really warms my heart to see these family photos. Parker is an absolute doll and looks so much like his daddy. My love and admiration for Clay has only grown stronger over the years. when you become a teenager, haha. Anyway, It was nice to see Clay happy with his family. Gosh, I wonder what little Parker looks like now. He is such a cutie at almost a year!!! It's 2012 lets see some recent pics of everyone. Error: Error validating access token: Session has expired on Tuesday, 21-Aug-18 16:13:01 PDT. The current time is Monday, 22-Apr-19 07:24:58 PDT.